1. Make it flavorful. It’s not just a vision of sugarplums on that treat table — that buffet is really, truly brimming with cookies, candies, and other goodies. Why not do something different? This year, make a salty, spicy or savory appetizer for the holiday parties. Your contribution will stand out among the plethora of sweeter treats. For an appetizer that is salty, savory, and spicy, we recommend these Herbes de Provence Marinated Olives. (This is a good make-ahead, or make-a-double-batch kind of recipe). 2. Make it fast. You’re busy. With so many social functions happening in such a short time frame, you’ll need to make the most of brief windows of opportunity. Choose recipes that are quick and easy. 3. Keep it finger-friendly. Holiday parties tend to be crowded, eat-and-drink-while-standing affairs. No leisurely sitting at a table, here. You’ll need one hand for holding your plate, one hand for holding your drink, and one hand for shaking hands…. oh. To have a free hand for shaking, you’re going to have to give up the snack plate (heaven knows you aren’t going to give up that thirst-slaking beverage in your *other* hand). But don’t fret: if you bring finger food to the party, you can forego the cumbersome plate and graze at your leisure. 4. Keep it fastidious. 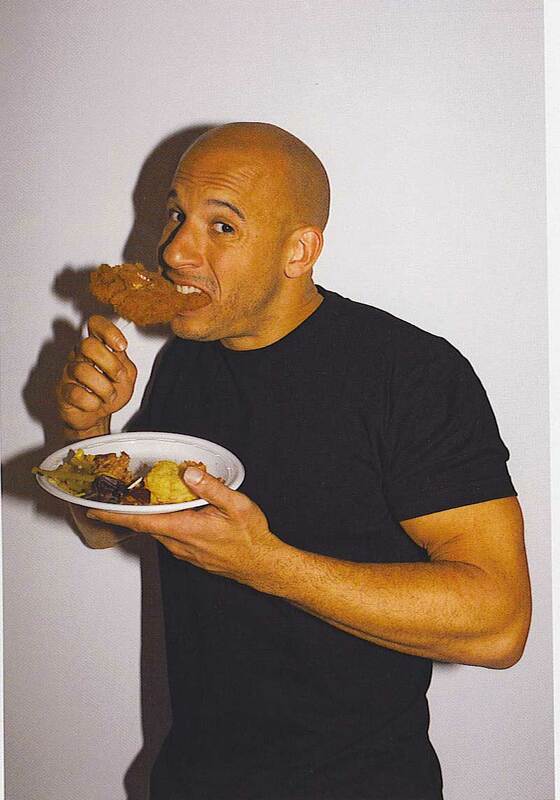 “Fast and Furious” movie star Vin Diesel may be able to pull off that eating-a-huge-chicken-cutlet-on-a-stick-in-a-plain-black-t look. But you (and your awesome Andy Williams-style vintage snowman sweater) will look much more dapper if you don’t “decorate” yourself with a coating of breading and splotches of ranch dip all down your front. You *do* want to win that Ugliest Christmas Sweater contest, don’t you? Okay, then. Make those dips thick (like the one, above). Make those appetizers chunky instead of crunchy (fewer shards to shatter on your shirt). Put it on a disposable skewer (or have toothpicks nearby) for dainty snack delivery from the platter to your mouth. Cherry Tomato-Mozzarella Skewers are dusted with basil and drizzled with a little Balsamic Vinegar or some Saba Grape Must Reduction, like a tiny, tidy Caprese-on-a-stick. If you’ve got a big appetite, bring along some Goat Cheese Crostini or another of our many appetizer recipes. 5. Make it fun (and festive). The whole point of holiday celebrations is, you know, to celebrate. Not to stress out or spend time doing things you don’t enjoy, or eat things that are anything but fun and festive. What snack foods make you think of the winter holidays, and make you feel warm and happy inside? Although you can buy it ready-made at the store any time of year, one of our favorite “party food” traditions, dating all the way back to childhood, is making homemade Chex Mix for the holidays every year. Just follow the directions on the back of the cereal box, or use these instructions for Bacon Fat – Bacon Salt Snack Mix (!!!). From Thai-spiced to barbecue to sweet to pie-themed, we’ve got dozens of variations on Chex Mix recipes (including Iowa State Fair award-winners) in our recipe section. *The “most wonderful time of the year” is not complete without the requisite “marshmallows for toasting:” stop in and pick up our new double-chocolate gift bag ($12). The pack includes a jar of our Cafe Blend Hot Chocolate, an Ethereal Confections Meltaway chocolate bar, and some gourmet caramel swirl marshmallows.